“If only most of the individuals in the Western World were not so blind to see real greatness, Dolci would be even more famous than he actually is”. In the volume “Conversazioni con Danilo Dolci” (Conversations with Danilo Dolci) – published by Mondadori in 1977 and then forgotten for more than thirty years – Giacinto Spagnoletti has collected previously unreleased interviews, dialogues and radiobroadcast transcripts that suggest a fascinating and dense dialogue with Danilo Dolci. 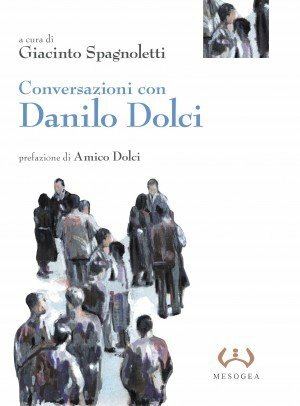 By weaving in a fluid prose Dolci’s private life and public and political engagement, the author tries to convey to the reader the pleasant sensation of reading a book and of being engaged – at the same time – in a private conversation with Danilo Dolci as a poet, a pedagogue, an activist and a man. This book “aims at serving – either for a little or for a long time – people who are following the same path toward freedom and liberation”, as Giacinto Spagnoletti has stated. Giacinto Spagnoletti (1920-2003) was an essayist, literary critic, historian and writer. He was also professor of Modern Italian Literature in many Italian universities. Below we would like to present a few passages from Giacinto Spagnoletti’s book (pp. 68-69), concerning Danilo Dolci’s relationship with Carlo Levi and Elio Vittorini. “As a rule, I don’t ask for money […] but in case it was absolutely necessary, I used to call, for example, Carlo Levi, he would come immediately and sell a painting, if needed; once Vittorini donated us all the book sale proceeds of one of “Conversazioni in Sicilia” (Conversations in Sicily) editions. With that amount of money, I remember we built the roof of the second house, which was the kindergarten […] He was a charming man, with a special sing-song voice ; at that time I was more interested in his personality than in his qualities as a literary man. Note: All the texts written by or about Danilo Dolci are available at our Center library.